The Jimmy Carter Education Program has partnered with the Federal Highway Administration Georgia Division (FHWA) and the Georgia Department of Transportation (GDOT) to co-sponsor a program to help kids better understand their history as told through archaeology. The goal of this unique partnership is not to teach kids how to be archaeologists, but rather to use archaeology as a tool to stimulate creativity and interest in learning about cultural heritage. The partnership is central to FHWA’s and GDOT’s vision and underpins the framework for giving back to local communities through environmental stewardship. Beginning in the spring of 2004, students in Sumter and Schley Counties, through the Jimmy Carter Education Program, were provided a hands-on introduction to archaeology field methods and excavation on a FHWA and GDOT sponsored archaeology project in Sumter County fully supervised by professional archaeologists. 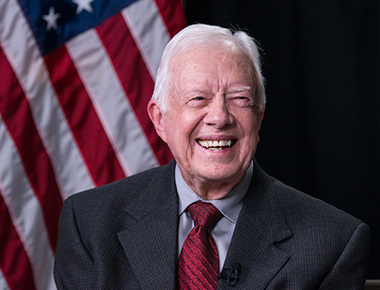 The partnership will provide the Jimmy Carter Education Program with an archaeology trunk designed to help teachers in the Sumter/Schley County area more effectively integrate archaeology and cultural heritage education in the classroom. The archaeology trunk will include a wide array of diverse archaeological teaching material that will meet Georgia’s Quality Core Curriculum Objectives. The student’s classroom experience will be accentuated with hands-on instruction of archaeology field methods and excavation techniques supervised by professional archaeologists on a FHWA and GDOT sponsored project in Schley County. The partnership culminated in 2005 with an archaeology public involvement day that provided professional archaeologists the opportunity to disseminate the results from both the Sumter and Schley County archaeological excavations in an educational presentation to students at the Jimmy Carter National Historic Site Education Program. For more information, please contact Annette Wise, Instructional Specialist, Jimmy Carter National Historic Site Education Program at (229) 824-4104 ext.16 or Eric Anthony Duff, Staff Archaeologist, Georgia Department of Transportation at (404) 699-4437.